This is my 2-year-old daughter, Margaret! I've been planning this costume idea since she was an infant, and it's all thanks to the hidden soft side of my husband. After our daughter was born, he insisted that our friends and family call her by her full name... no nicknames! The reason being was that as boy, he had been constantly teased and humiliated with nicknames he didn't like.... so he didn't want his little girl to go through the same thing. Although my husband swears he won't call Margaret his little "mogwai" when she's older if she doesn't like it, I can tell that he's secretly tickled HE was the one who gave it to her in the first place! 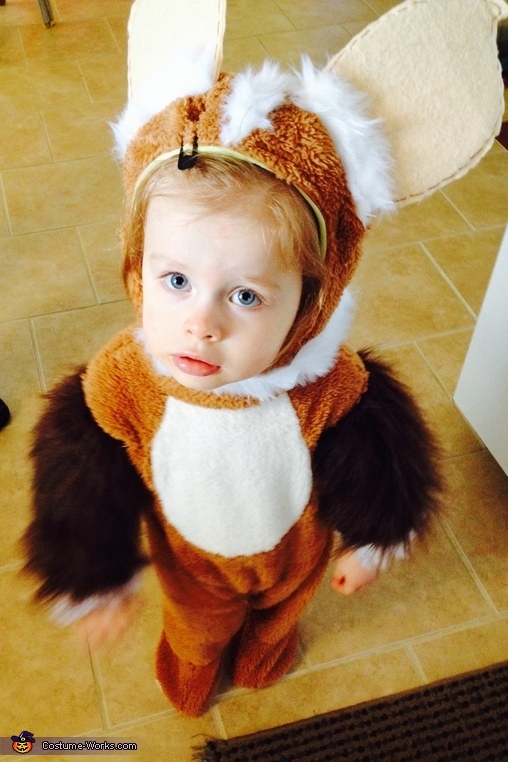 I bought a cheap basic "Baby Bear" suit from Walmart to be the foundation of her costume. I then bought fur patches and felt squares from Hobby Lobby to sew onto the suit. I enlarged the arms to make them look "chubby" with the added dark-brown/white fur. I extended the chin strap with white fur, and also added the white mohawk strip from front to back. The fuzzy cap that came with the bear suit was way too small for Margaret's head, so I extended its coverage with a large white flap on the back. Lastly, I cut out the ears from cardboard and covered both with skin-colored felt. I stitched down the ears with extra white fur onto each side of the cap (so they wouldn't flop around in Margaret's face). This costume was so much fun to make! And as we went trick-or-treating, I was so pleased when both neighbors and strangers actually recognized what kind of little monster she was!